Data ID Systems specializes in developing bar code software. Custom and off-the-shelf programs assist with document tracking, asset tracking, inventory, and toolroom applications. The CheckMate series of application programs has helped hundreds of large and small organizations take advantage of the speed and accuracy of bar code data collection. Any organization, where paperwork is handled by many people, can achieve substantial time savings with CheckMate Document Tracking. If depleted stock levels could cause a problem, CheckMate Inventory Tracking is the solution. CheckMate Tool Tracking can bring a stop to expensive losses from the toolroom. We are very pleased to announce the latest member of the CheckMate family: Capital Assets for Windows. 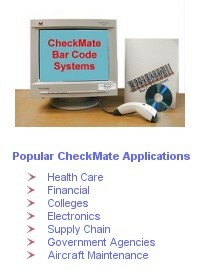 CheckMate Capital Assets uses the speed and accuracy of bar codes to make data collection easy! Checkmate Capital Assets utilizes the power and economy of your personal computer to make precise asset tracking affordable. And CheckMate Capital Assets for Windows takes full advantage of the world's most popular operating system. CheckMate Document Tracking - web basedbar code data collection for keeping track of things that move around the office. CheckMate Toolroom - web based bar code data collection for keeping track of things that move around the shop floor. CheckMate Inventory - bar code data collection to help issue, receive, physical inventory, reorder. CheckMate Document Tracking - bar code data collection for keeping track of things that move around the office. CheckMate Toolroom - bar code data collection for keeping track of things that move around the shop floor. Tag & Bag - label printing for USPS-compliant on-demand tray tags, sack tags, and ACT tags. Enterprise - D&R tag printing in communication with the USPS STARSHIP system.